Two Huge Events for Car and Motorcycle Enthusiasts! | Hupy and Abraham, S.C.
Two Huge Events for Car and Motorcycle Enthusiasts! It’s that time of year again, and the auto show event scene is warming up just in time for spring. 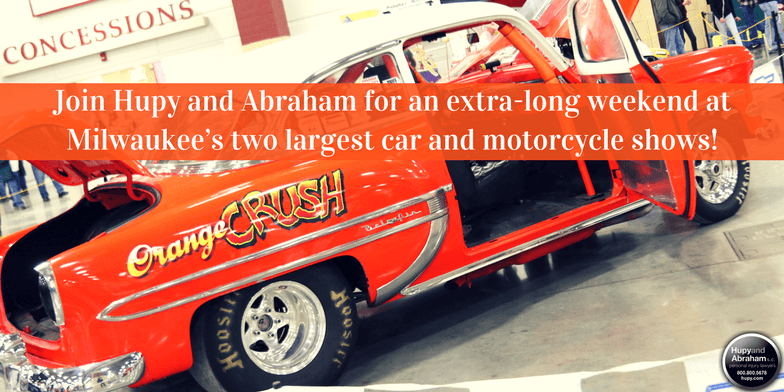 Join Hupy and Abraham for an extra-long weekend at Milwaukee’s two largest car and motorcycle shows. The 55th Annual O’Reilly Auto Parts World of Wheels will be at State Fair Park February 24-26. As Milwaukee’s largest indoor custom car show, this national event has something for everyone. At World of Wheels, you can expect a flurry of activities to keep you busy all weekend. Features include custom cars, trucks, hot rods, the Steel Master Build competition, a pin-up contest, the Pinstripe Charity Auction and live music. Motorcycle enthusiasts can even check out the return of the Hupy and Abraham-sponsored T.S. Customs Motorcycle Show! The 2017 Greater Milwaukee Auto Show will return to the Wisconsin Center February 25 through March 5. This show features over 400 of 2017’s newest cars, trucks and SUVs. This nine-day event will also feature on-site specialists and interactive displays that will educate and entertain the whole family. Hupy and Abraham is a proud sponsor of the Milwaukee Auto Show and is excited to see all the great new safety features that automakers have in the works for 2017! There’s something for everyone at both World of Wheels and the weeklong Greater Milwaukee Auto Show. So come visit the Hupy and Abraham Street Team at our sponsored booth, and pick up some free Watch for Motorcycles materials and other automobile-related safety information.